It was a good sign – 'Bright lights are no substitute for love' was ringing in my head this morning when I woke up: Andy McMasters's catchy song had passed the Old Grey Whistle Test, exactly what Chrysalis must hoped for when they commissioned a determinedly commercial set of songs from James Dewar some twenty years ago. Why they then decided to lock the album away for so long will remain a mystery, but Dewar / Fisher enthusiasts should be glad that it's finally earned its parole. On a second listening, I found that the stonking brass riff that was playing in my mind had actually transplanted itself from a quite different song, Love's Melody. To call McMasters's four ultra-commercial songs here 'samey' would be unjust, but no-one would have any trouble picking out the numbers that came from the author of the Motors' Airport hit. Each is a well-crafted pop single in its own right, relying on a quaver-intensive Jerry Lee-lite style of bubblegum piano that is also heard (to more dramatic purpose) on Matthew Fisher's Give it a Try, the should-have-been hit single from his self-titled 1980 solo album. James Dewar sang back-up on that Fisher album, of course; and the present collection is much more closely-related to that material than it is to the first Dewar / Fisher outings; here there is none of the moody blue spareness of Twice Removed from Yesterday or of Bridge of Sighs. But the singing is all heartfelt, warm and personal even in the most commercial material; the articulation is excellent, and there's a much more varied range than you might expect from the Trower vocalist. 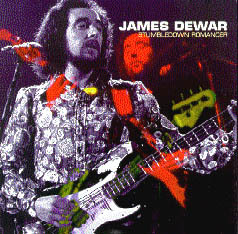 Dewar himself plays very little bass here (he was eventually freed from bass-playing duties to concentrate on singing with RT) and it seems clear that the album was intended to showcase his excellent vocal skills: he also handles all the backing vocals feelingly, which are nicely-arranged, though conventional. He plays some neat guitar, but there's surprisingly little to be heard – another gambit, I would imagine, to differentiate this from the Trower sound-world. A relatively-large pool of fine session players (see table below) contributes the backings here, though they are mostly playing pretty safe. Some will be no strangers to Procoholics: Dave Mattacks (who also played on No More Fear of Flying) can be heard on the Matthew Fisher album, which also features Stumbledown Romancers Mo Foster and Paul Westwood; Peter van Hooke and Alan Jones were the rhythm section on Matthew's 1981 Strange Days, and Bill Lordan, who drums on a single track here, is familiar to all fans of the Trower trio. And there's plenty of keyboard work from Matthew himself: in fact it 'fills any cavities left in the musical fabric' as Bud Scoppa once said of the organ in Procol Harum. People who think Grand Hotel is over-produced may extend that criticism to this set – there's little of the organ-understatement we heard on Trower's I Can't Wait Much Longer, for example. But most Fisher fans welcome keyboard-interest! The lively Stones' cover, that opens the show, foregrounds a Shine on toned Hammond-phrase, brightly combined with Tamla-esque tambourine. And there's one other huge Hammond surprise, of which more below. The three cover-versions are widely different: Dewar's warm, plaintive tenor distinguishes the countrified Buddy Holly cover, and he approaches Orbison heights on the Leiber / Stoller number, though in my household his rasping, gutsier tones won more votes. But as Judith Fisher says, the album was intended to have something to appeal to all tastes. The 'new' Dewar / Trower song is a very relaxed shuffle, whose doot'n'doo B.Vs, dobro-like voicings (Dewar himself) and synth padding would be very uncharacteristic in a Trower solo context. Listeners who tend to 'reach for their revolvers' when they hear the word 'synthesiser' should know that the string-sounds here are innocuous and the 'brass' belts out convincingly; the solo synth sounds are decorous and muted, with the possible exception of the Cor Anglais-like sound generated by the Arp Odyssey in the Dewar / Fisher Hosanna, a track which I find a bit problematic. Its mood of joyous anticipation is a baffling contrast with the downbeat flavour of most of the song-words on this all-but featureless black disc. But maybe Hosanna would not have stood out so markedly in its vinyl context, concluding side one where an oddball track can be easily 'lost'. Of course no-one would begrudge James Dewar a Christmas No 1 in his present unhappy plight, and there's something very touching about the big-voiced bluesman being smiled at by the Infant King. But the fervently-humming congregation, the discreet beatbox handclaps and soul-hollering playout are too calculated for my tastes; and by striving (like Within Our House) for a non-denominational acceptability, the words succumb to blandness. Images of Jesus lying 'on silver sheets' and having 'satins on his bed' stand out not for any theological worth but simply as contrasts to the non-committal vagueness of 'I wonder if it's wrong and I wonder if it's right / that I should see the new-born King'. Musically, though, the song is classic Fisher in his AOR vein, with the diatonic hymn-like changes that we love him for over step-wise bass work (the excellent Mo Foster). Typically-fluent, rolling electric piano underlies the equally-characteristic changes of Nature Child, the closing track, which commemorates a 'strange little girl' – the 'dawn' to the singer's 'evening' – who is 'running free and wild' and 'flying to a world I'll never see' in a manner redolent of Barclay James Harvest in their Galadriel period. Characteristically, though, the mood here is of love lost rather than found. The flavour overall is very much late-seventies pop, but it's worth mentioning that the sound quality throughout is superb. If any Fisher completist is still uncertain whether or not to get this album, the title-track will tip the balance. This is a classic in anybody's terms, the sort of plaintive ballad it would be so nice to see anyone from Rod Stewart through Chris de Burgh to Joe Cocker selling by the shipload. The words deal with the incompatibility of life in a touring band and the quest for 'a love of my own'. Verse one is backed with beautiful colla voce electric piano; then the rhythm section cranks in à la Going for a Song and a second verse leads – via some bitter laughter off-mic from the 'rock-and-roll sage' – into the rueful melody of the chorus. Maybe that triple rhyme is a characteristic Fisher device, likewise the apparent introspection? Judith Fisher tells that 'Jimmy and his family were living just round the corner from Matthew'; so some will assume that a blending of identities occurred, as if angst might osmose from one collaborator to another. Dewar, they will argue, must have been a comparatively happy man, living with his family and riding so high professionally that Chrysalis was commissioning a whole album from him.